Can TNT make a success of the heist genre in '08, after TV shows sublime (FX's Thief), ridiculous (NBC's Heist) and in between (CBS' Smith) all tanked in '06? Hey, if TNT could make a hit out of the dreary legal drama Raising The Bar, then they've clearly developed a viewer-base that's more interested in the brand than what it's being slapped on. And they're going to need that loyalty to sell Leverage, a breezy caper series that can't overcome its basic familiarity (and inconsequentiality), no matter how much it keeps winking at the audience. Timothy Hutton stars as Nathan Ford, a top-flight insurance investigator (like Banacek!) who quit the game when his own bosses wouldn't pay to save his dying son. As the series opens, Ford is cornered at a bar by an earnest aeronautics engineer (played by Saul Rubinek), who pitches a sob story about the corporate giants who swiped the plans for his new plane, and how he wants Ford to help swipe them back. His argument? Ford knows how it feels to get screwed-over, and should want some measure of cosmic revenge. So Ford agrees to work with the team of crooks already assembled–all of whom he's familiar with from his previous line of work. There's Alec, the computer geek; Eliot, the brute; and Parker, the half-mad cat burglar. Their elaborate heist is meant to be a one-time only deal–a "walk-away"–but when the client fails to pay for the job on completion, they decide to hang on a little longer, and execute another sting. And when that inevitably goes well, they decide to make this gig permanent. Have a Robin Hood-esque job that needs doing? Ford and his team of nogoodniks will be on TNT every Tuesday night for the twelve weeks, showing the ropes. But is it worth the effort to learn them? 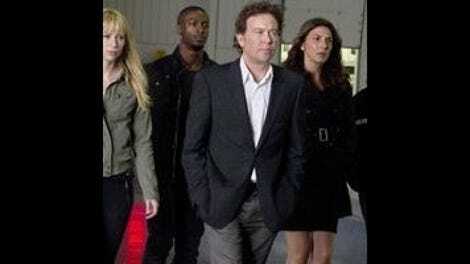 Leverage was produced by Dean Devlin, the man behind TNT's popular Librarian seriies, and like those movies, Leverage is the kind of basic-cable programming that will do in a pinch, if there's nothing else on and you really want to watch some TV. Yes, the casting is fairly ridiculous. Hutton is fine as the righteous ringleader of a gang of degenerates, but nearly everyone else on the show offers little more than a contrived tweak on hoary archetype. (The tech-genius Alec is a suave African-American; the hulking, long-haired Eliot is a lithe martial artist, etc.) And yes, the action sequences are so straightforward that one of the big set pieces involves, yes, the whole team fleeing an abandoned warehouse just ahead of a fiery explosion. And yet there's nothing egregiously wrong with Leverage either. Spun the right way, or given some better capers, this team of rogues could be another A-Team. Certainly the "Don't take any of this too seriously, folks!" tone is a sign that the creators have their hearts in the right place. Still, the biggest problem with this show is that we no longer live in a world where we have to settle for Leverage when we want to watch some TV. We have TiVo now; there's always something better on. Like, doesn't USA have a Burn Notice marathon coming up? -One exception to the blah casting note: Beth Riesgraf as the unstable master-thief Parker has an appealingly kooky energy. I didn't buy the story about her blowing up her parents' house as a girl in order to get her stuffed bunny back, and I rolled my eyes when she described her reaction to getting stiffed on the first job as, "That makes me cry inside in my special angry place." But when she responded to Ford's new team member Sophie's post-job shopping spree with an exasperated, "What is it about women and shoes?" I think I fell in love a little. Not enough to watch a second episode, but still….